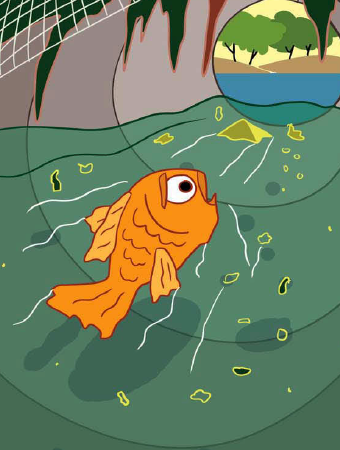 Sona, the goldfish lived in a big aquarium with her parents. The aquarium belonged to a family who loved fish and kept many more fish apart from Sona and her family. Sona’s owners always fed their fish the yummiest food and Sona had nothing to worry about. Sona’s best friend was Mona, the clown fish. Sona and Mona spent the entire day together. They swam across the aquarium, looking for food or playing games. One day, the lady of the house decided it was time to reorganise the house and rearrange the furniture. Once all the furniture had moved around, the aquarium was placed in a part of the room from where the fish had a clear view of the TV. Since then, Sona and Mona spent the entire day watching TV. They barely ate and completely stopped swimming around the tank. They only slept when the TV had been switched off. Sona’s mother tried warning her about the ill effects of watching TV all day, but Sona wouldn’t listen. 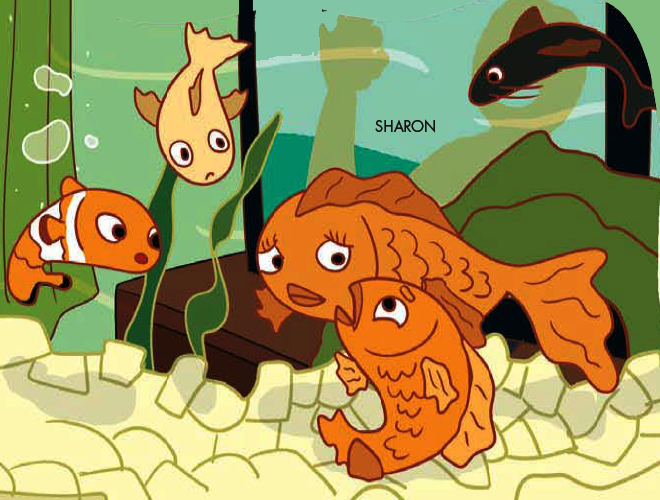 One day, Sona and Mona watched a nature documentary on TV about the life of fish living in the ocean and in rivers. After watching the documentary, both Sona and Mona felt that their aquarium was too small. Sona kept asking her mother to take her to the ocean. “We are fish, Sona,” said her mother. Sona, however, wasn’t ready to accept defeat. She spent all day and all night trying to think of the perfect way to get to the ocean. She continued to watch TV, hoping to find a program that could teach her how to escape from the aquarium. One day, Sona watched a program where the person on TV said, “Impossible is nothing. If there’s a will, there’s a way.” Sona was deeply inspired by this and convinced Mona into thinking of a solution with her. 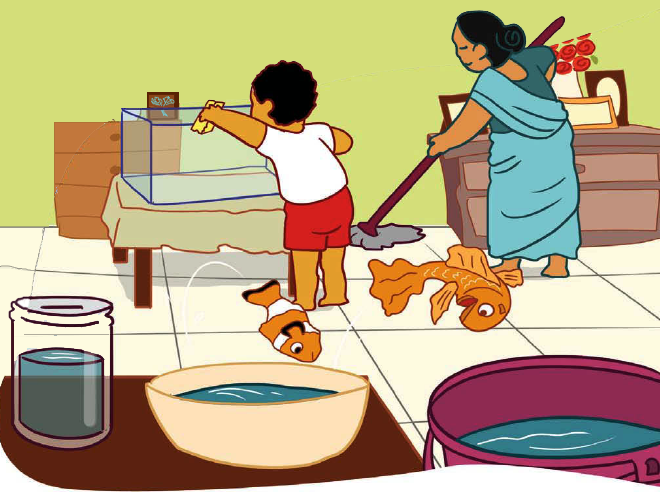 Then, one day, when the little boy of the house was cleaning the aquarium, he removed all the fish, one by one and placed them in smaller jars and bowls. Sona and Mona were in the same bowl and Sona noticed the maid wiping the floor. She had a bucket of water which she took from room to room. This was the chance Sona was waiting for. She explained her plan to Mona and together, they waited for the maid to come closer with the bucket. Sona shot out of the water and landed in the bucket. Mona tried too, but her jump wasn’t good enough and she fell back inside the bowl. Once in the bucket, Sona felt like something was wrong. There seemed to be some sort of chemical in the water that made her head spin every time she took a breath. Sona didn’t know how long she could hold her breath, but she decided it was better than breathing in all the chemicals. Fortunately for her, the maid emptied the bucket soon. But, it seemed as if Sona had jumped out of the frying pan and landed in the fire, because the maid had emptied the bucket in the drain. The water here smelled foul and Sona had to hold her breath again. Not yet ready to give up, she swam through and soon, found herself in a bigger pipe. She swam in the direction of the water and found herself in a little river. The water here was not very clean, but it definitely was a lot better. Sona had grown very hungry by now and was desperate to find some food. But instead of finding food to eat, she found herself being food for bigger fish. Fortunately for her, Sona was a lot faster and more nimble than the bigger fish and she managed to stay safe. Eating scraps of food here and there, Sona managed to survive for a few days. Life outside the aquarium was tough as she constantly had to hide behind rocks to escape from the bigger fish. Also, the water was nowhere even nearly as clean as it was in the aquarium. One day, Sona saw a big juicy worm floating in the water. She looked around to see if any other fish had seen this worm. The coast was clear and Sona tried taking a bite out of the worm. 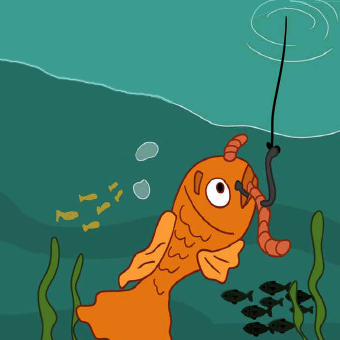 Instead, she found herself caught on a hook. A fisherman had used the worm as bait to catch her. The fisherman put her in a bucket of water and took her to his home. He was going to eat her. As the fisherman pulled her out and placed her on the cutting board, the fisherman said, “I can’t wait to have you for dinner. As he brought the knife down on her, Sona screamed and closed her eyes. She suddenly heard her mother’s voice. “Sona, what’s the matter dear? Are you alright?” she asked. Sona opened her eyes and saw that she was still in the aquarium. It was all a dream. Hearing her scream, several fish came up to her to ask if she needed anything and whether she was okay. Sona calmed down and breathed a sigh of relief, and started explaining others her adventures from the dream.